Original Editors - Jordan Bormann from Bellarmine University's Pathophysiology of Complex Patient Problems project. Sarcoidosis (sar-coy-doe-sis) is a potentially life threatening disease with no known cause or cure. The duration of this disease varies and can last from only a few short months to several years. Often times, sarcoidosis is self-limiting needing no medicinal treatment. The primary manifestation of sarcoidosis includes inflammation of the lungs as well as many other bodily organs. About 90% of diagnosed cases are deemed to be pulmonary sarcoidosis. The pulmonary involvement affects the lungs by forming inflamed masses of tissue known as granulomas in the lung parenchyma (alveoli, bronchioles) and lymph nodes. Results include stiffness of the lungs due to scar tissue formation causing decreased oxygen uptake and gas exchange in the bloodstream. Other involvement of sarcoidosis can manifest itself as inflammation of the epithelial tissue, eyes, liver, spleen, heart, kidneys, central nervous system (CNS) and bones of the hands or feet. Although this disease has not always been well known, cases have been recorded worldwide and are becoming increasingly more common. Patients most commonly affected by sarcoidosis are 20-40 years of age. Women are more affected than men (6.3 per 100,000; 5.9 per 100,000) listed respectively. African Americans are the most diagnosed ethnic group in the United States and have a prevalence of four times that of the diagnosis for Caucasians (2.4%; 0.85%). In the United Kingdom, 5-10 per 100,000 individuals are diagnosed with sarcoidosis. It is the most common interstitial lung disorder in the western part of the world and has an increased incidence in Irish, West Indian, and Scandinavian people. Patient presentation is dependent on organ involvement and severity of the disease process. Almost 33% of patients present with non-specific symptoms which may include fever, weight loss, weakness, and/or malaise. Organ involvement is one of the most important determiners for presentation. Individuals who have pulmonary involvement often time present with a dry cough, dyspnea, and chest pain/discomfort. Patients of this type will often times have a sudden remission or quick and progressive loss of pulmonary function due to fibrosis of lung tissues. Another important factor that plays into the presentation of patients includes the stage in which they present to the clinic. Sarcoidosis has 4 stages with stages I and II being less involved with less severe or no symptoms at all. The later stages, III and IV, include more severe symptoms and a further decrease in organ function. For pulmonary patients, increased tissue fibrosis, decreased airflow, persistent cough, and a possibly of bronchiectasis. Of the stages, remission periods vary greatly. Stage I has a remission period of 55-90% while stage II has been recorded from 40-70%. The more severe stages have been recorded as follows, 10-20% and 0-5% respectively. Other common organ involvement includes the liver which may show granulomas from testing. However, the liver function may not be severely affected by the inflammatory process. 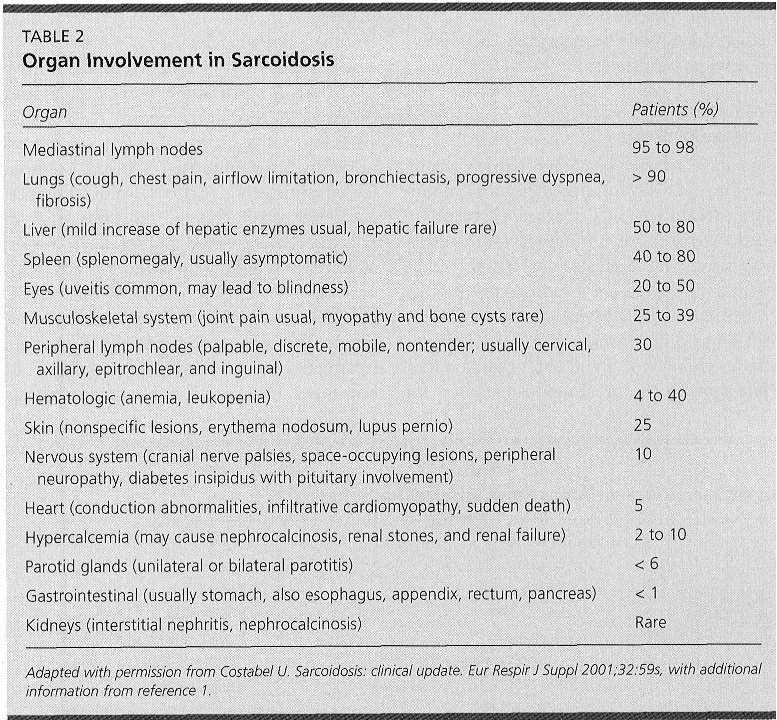 Skin involvement is present in over 1/4 of patients with sarcoidosis. The most common lesions include plaques, nodules, erythema nodosum, and lupus pernio. 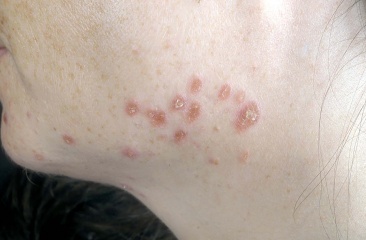 Common presentation of lupus pernio includes involvement of plaques around the individual's lips, cheeks, nose, and ears indicating a more chronic stage of the disease. As with many other systemic diseases, sarcoidosis has several co-morbidities. Of all the patients diagnosed, 10-35% will suffer from acute arthritic changes. These symptoms most commonly occur in the knees and ankles symmetrically and involves many joints. The arthritic changes vary in their duration and are self-limiting within weeks to months. It is possible that these symptoms may become chronic and reoccur for periods of time, but joint changes continue to stay minimal. These symptoms vary in their timing of the disease and may become present early or late in the disease progression. Along with the arthritis, erythema nodosum and hilar adenopathy may also be present. These three symptoms combined are known as Lofgren's syndrome and can also be self-limiting. Muscle involvement may also present itself as sarcoid myositis. Other co-morbidities include nerve palsies, mononeuropathy, and polyneuropathy. Polyneuropathy is more rare than other symptoms and may present symmetrically. The most common type of medication used for treating sarcoidosis is corticosteroids. There are two main steroidal medications used which include prednisone and prednisolone. Antimalarial agents may also be used for treatment. Integumentary symptoms and hypercalcemia are often treated with the antimalarials chloroquine (aralen) or hydrochloroquine (plaquenil) and other drugs such as thalidomide (thalomid). For more chronic symptoms of sarcoidosis, methotrexate (rheumatrex) is used although it is ineffective for six months or longer. Azathioprene (imuran) has several common side effects of including nausea and neutropenia. Other drugs are limited in their effects due to toxicity levels such as cyclophosphamide (cytoxan). Although many other drugs are available and have been tested, several do not have evidence based date or reports of their usefulness. Such drugs include pentoxifyline (trental), cycloporine (neoral), and infliximab (remicade). Sarcoidosis is often time hard to diagnose due to no specific testing for the diagnostic process. It is most commonly diagnosed through a clinical examination and thorough history. Additional testing methods for the evaluation and diagnosis of sarcoidosis include posteroanterior chest radiographs, pulmonary functioning tests (spirometry, lung capacity), blood counts (WBCs, RBCs, platelets), serum levels (calcium, liver enzymes, creatine, urea nitrogen), and tissue biopsy (lymph nodes, skin, salivary glands, transbronchial). Other include urine analysis, electrocardiogram (ECG), opthalmologic examination, and Tuberculin skin test. Several other granulomatous diseases must be ruled out before a diagnosis of sarcoidosis is given. These disease include tuberculosis, lymphoma, carcinoma, berylliosis, and several fungal diseases. Of the symptoms present, CNS and pulmonary involvement are usually diagnosed on a delayed time period. However, dermatological symptoms are most easily diagnosed. Sarcoidosis has no known cause. However, some researchers believe the course of the disease may have genetic connections or result from an immune response. Others possible causes include viruses, bacterias, dust particles, or chemical exposure. Due to the vast nature of the manifestation, other researchers have led one to believe that there may be several causes. Although many individuals require no treatment, the most common method includes corticosteroid treatment. The most common medication is Prednisone. However, no specific treatment guidelines have been set to allow physicians to prescribe dose and frequency of medication. These parameters are often prescribed based on disease location and progression. When physical therapy is indicated, the main purpose is to restore or preserve the function of the involved organs and increase ventilation, endurance, and strength. Physical therapy treatment is based on the symptoms that the individual presents with. Acute sarcoidosis often times regresses spontaneously. However, more chronic stages of sarcoidosis require treatment based on the involved systems. In most cases with pulmonary involvement, physical therapy can be helpful by increasing ventilation through strategies which may include breathing exercises, strength training, and endurance exercises. The result of these treatments ay be variable, but are designed to allow the patient a more normal life by decreasing dyspnea, increasing endurance and decreasing fatigue. Both upper and lower extremity exercises can be used along with the breathing exercises for optimal treatment outcomes. ↑ 1.0 1.1 1.2 1.3 1.4 1.5 1.6 1.7 1.8 Fuller KS, Goodman CC. Pathology implications for the physical therapist. 3rd ed. St. Louis: Saunders, 2009. ↑ 4.0 4.1 4.2 4.3 4.4 4.5 4.6 4.7 4.8 Wu JJ, Schiff KR. Sarcoidosis. American Family Physician. 2004; 70,2: 312-322. ↑ Ho LP, Urban BC, Thickett DR, Davies RJ. Deficiency of a subset of T cells with immunoregulatory properties in sarcoidosis. The Lancet. 2005; 365: 1062-1072.